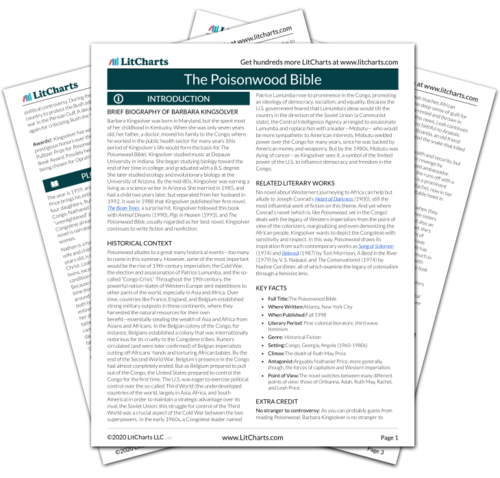 Instant downloads of all 946 LitChart PDFs (including The Poisonwood Bible). 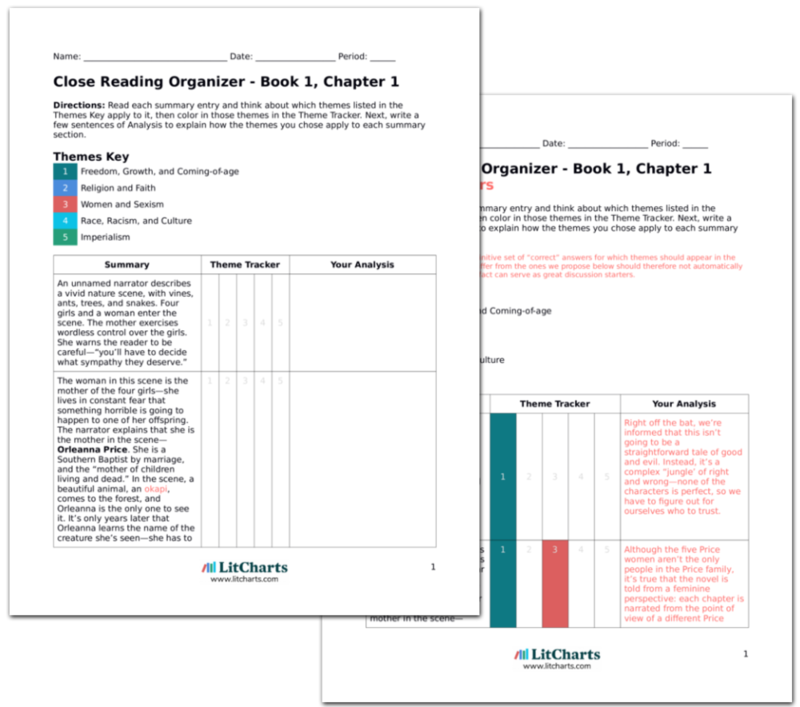 LitCharts assigns a color and icon to each theme in The Poisonwood Bible, which you can use to track the themes throughout the work. Leah thinks back to the day of the hunt—a day that should have been glorious, but wasn’t. She’ll remember what happened for the rest of her life. The chapter begins on a note of regret, paralleling the tone we’ve heard coming from Orleanna in her retrospective chapters. The hunt ends, and the villagers celebrate by dancing and shouting. Ruth May is scared of the celebration and hides in Orleanna’s arms. Meanwhile, a few of the hunters, led by Tata Kuvudundu, argue that Leah shouldn’t have been hunting at all, in spite of her talent with a bow. When the time comes to divide up the meat, Tata Ndu cuts up the meat and throws a portion to Leah. Instead of accepting it, Leah throws it back, refusing her share out of pride. As we’d already seen (via Nelson’s insult to Gbenye), the village of Kilanga is still full of sexist traditions. Leah behaves stubbornly in this scene; she’s almost behaving like Nathan, refusing to compromise on her principles. Tata Kuvudundu seems like a fitting rival for Nathan—he clings to his own rigid set of rules, and dislikes seeing women empowered. When it comes time for Anatole to receive his share of the meat, Anatole claims that he’s earned an entire buck for himself—a larger share of meat than Ndu is offering him. Suddenly, Tata Boanda tries to wrestle the bushbuck out of Anatole’s hands—Boanda clams that it was he, not Anatole, who shot it. A big argument breaks out, with everyone in the village taking sides. As the fighting escalates, the Prices take their share of meat, reversing Leah’s stubbornness, and return to their house. Leah notices Tata Kuvudundu, shouting about how the animals will “rise up” against the village. One could take this scene as a metaphor for capitalism itself, or as foreshadowing what’s going to come to the Congo as a whole. The sudden changes in the village, coupled with the presence of unfamiliar people like Leah, compels people to argue and greedily claim more than they deserve. This reminds us that Anatole’s claims for his community—i.e., that in Kilanga everybody takes their fair share and nothing more—were idealistic, to say the least: where there are humans, there’s always greed. Arn, Jackson. "The Poisonwood Bible Book 4, Chapter 55." LitCharts. LitCharts LLC, 29 Jun 2016. Web. 24 Apr 2019. Arn, Jackson. "The Poisonwood Bible Book 4, Chapter 55." LitCharts LLC, June 29, 2016. Retrieved April 24, 2019. https://www.litcharts.com/lit/the-poisonwood-bible/book-4-chapter-55.